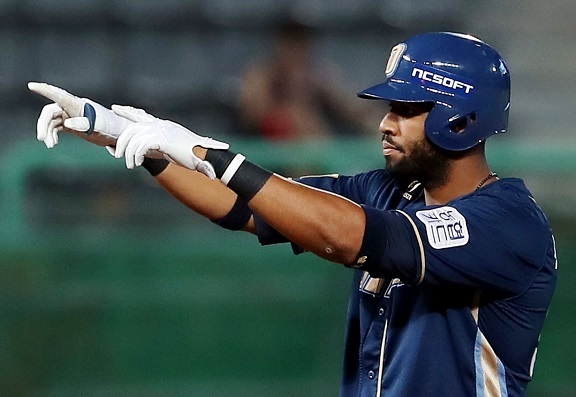 Xavier Scruggs hit a walk-off two-run home run in the ninth inning of Thursday’s Korean Baseball Organization game between the Lotte Giants and NC Dinos to give NC a come from behind 3-2 victory. Lotte entered the bottom of the ninth inning with a 2-1 lead, and with closer Son Seung-rak entering the game, they looked to be in a good position to win their sixth straight game. Son had converted 24 of 28 save opportunities entering the game, and was the leader in WAR and ERA+ among KBO relievers. Son walked the first batter he faced, Park Min-woo, but settled down to strike out Na Sung-bum, NC’s top hitter. The next batter was Scruggs. Son, who averages nearly a strikeout per inning, seemed a good match for Scruggs, who is tied for the highest strikeout rate in the KBO. But Scruggs didn’t allow Son to put him in a strikeout situation, launching Son’s first offering 345 feet to right field for the walk-off win. The home run was Scruggs’ 23rd of the season, the sixth highest total in the KBO. Son collected just his third loss of the season, bringing him to 1-3. Scruggs’ late home run brought an exciting end to what had otherwise been a quiet pitcher’s duel, featuring strong performances from Lotte’s Josh Lindblom and NC’s Lee Jae-hak. Both starters surrendered less than a baserunner per inning; Lindblom walked 3 and allowed 3 hits over his 7 innings of work, and Lee allowed 5 hits and just a single walk over his 8 innings pitched. Lotte also turned a triple play in the fourth inning. With runners on first and second moving on a hit-and-run, NC third baseman Park Suk-min hit a sharp line drive that was snared on a dive by Lotte first baseman Lee Dae-ho. Lee then threw to second baseman Andy Burns for the second out, and Burns completed the triple play by throwing the ball to pitcher Lindblom at first. Lotte and NC will conclude their two-game series Friday.